The takeover of Bradford Bulls by Omar Khan's consortium has been ratified by the Rugby Football League. The governing body took the decision to switch the club's membership to OK Bulls Ltd after Khan's group bought the club from the administrators in August. 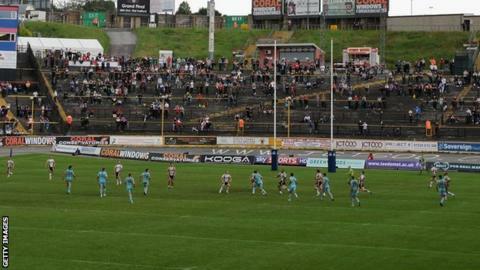 Bradford's membership was suspended in June when they entered administration. "The board's decision closes the door on much of the uncertainty that has surrounded the Bulls in recent months," RFL director Blake Solly said. "The club's new owners have co-operated fully with the RFL throughout this necessarily extensive process and we look forward to working with Mr Khan and Mr Sutcliffe in the months and years ahead. "The decision to grant membership is an important step that will help the board to determine which competition Bradford Bulls will compete in from 2013." No decision has yet been reached on what division the Bulls will compete in next season but an announcement is expected by the end of the week on how that decision will be reached. Bradford finished ninth in Super League this season, three points outside the play-offs, having been deducted six points for entering administration.